We are the experts in restoring tile and grout to a “BETTER THAN NEW” condition! Replacing tile and natural stone in a commercial building can be very expensive. 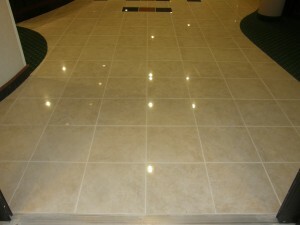 Grout Works of Illinois, Inc. can provide a fresh look at a fraction of the cost of replacement tiles. By utilizing our tile grout color service we can create a healthier environment for employees and guests of most any commercial space. So whether you have a commercial kitchen, commercial bath or any commercial common area that needs tile grout repair and refreshing, Grout Works of Illinois, Inc. can provide you with the perfect, economical solution. Grout Works professionals take pride in their work, their reputation and their industry. Grout Works has become one of the most trusted and respected tile grout cleaning and color sealing companies in the Country by offering the most durable and stain resistant grout color sealer available, with superior service and competitive pricing. The Grout Works team of professionals are highly skilled specialists that utilize the most advanced, proprietary products and techniques in the grout cleaning and color sealing industry. We are the experts when it comes to Grout Cleaning, Grout Color Sealing, Grout Repair, Grout Replacement, Grout Removal, Shower Restoration, Re-caulking, Tile Replacement and Natural Stone Care. Proudly Serving the entire Chicago area including but not limited to; St. Charles, Geneva, Oak Brook, Naperville, Fox Valley, Chicago Suburbs, Northern Illinois, Dekalb, Sycamore, Hinsdale, Oak Park, Wilmette, Winnetka, North Shore, The Loop, Western Suburbs, Crystal Lake, Arlington Heights, Wrigleyville and Downers Grove.